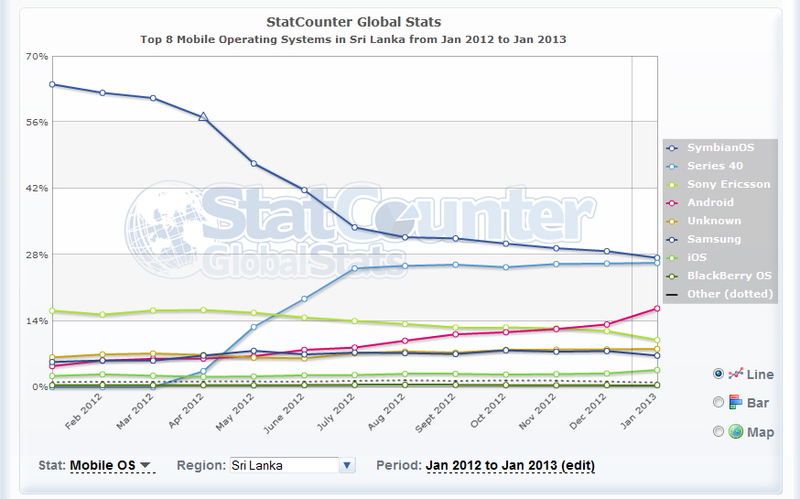 Statistics for internet users in Sri Lanka is now updated on InternetWorldStats.com, based on ITU sources. According to the latest published report, at the end of June 2012 the number of internet users in Sri Lanka stood at 3,222,200, a 28% increase in users within 6 months, compared to IWS’s published data for 3st Dec 2011. This data is further verified by Google’s Public Data Analysis (based on World bank Stats) which indicates a 15% internet penetration in the country at the end of year 2011. If the published numbers are only as of June 2012, then what’s the real number of Sri Lankan internet users at the end of year 2012? According to our prediction, the number is more or less close to 3.5 million users, if we apply the same YOY growth rate for last 3 years.At this rate we will cross the 4 Million internet users mark by the end of this year. Last year, we passed 1 million local users on Facebook, and as of today there are 1,529,700 Facebook users which is a 61% of total internet users. If we discount about a 500,000 of these accounts to be inactive and fake, we still have a significant number of people accessing Facebook from Sri Lanka every day. When I blogged about Sri Lanka crossing 2 million internet users mark last year, I mentioned the popularity of mobile broadband (dongles) as one of the major factors behind the growth. This year, on top of the mobile broadband (dongles) usage, there is another significant contributed to the growth. That is the enthusiasm among Sri Lankans to access the internet via mobile devices. According to Statcounter.com almost 20% of all internet visits coming from Sri Lanka today are coming from a mobile device. If this trend continue, we will see more people accessing internet using mobile devices than laptops and desktops by the end of year 2014. 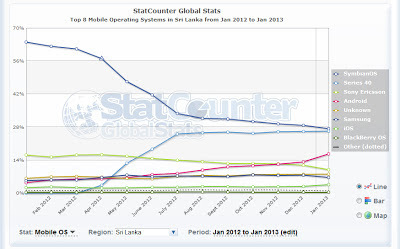 According to the public data published by StatCounter.com, there had been a significant increase in Nokia’s Series 40 mobile OS usage in Sri Lanka. Nokia Asha 300+ range (which operates on Series 40) has become extremely popular, mid-range internet enabled feature phone among Sri Lankan consumers, and many people access social networking sites like Facebook on these mid-range feature phones. At the same time, there had been a significant increase in the Android Penetration in Sri Lanka, which further fueled the growth of internet usage. Moving forward, here are some of the action points to be noted by Sri Lankan marketers during 2013. 1) Now it is not an ‘option’ to allocate a certain percentage of your advertising budget for digital media buying and adding a digital element into your campaigns. If you still planning to chant the ‘TV, Radio, Press’ mantra in ‘EST’ from morning to night, you are letting your competitors to dominate a significant 15% of the country’s population. 2) More internet users means more conversations happening online, more brand centric tweets and Facebook updates being circulated, and more vulnerable the bad brands become. This means, you need to start focusing more on ‘Social Listening’ and approach Social Media Marketing in a more professional way, than just rejoicing about the number of likes you gained on Facebook. 3) More internet users means, more people will start searching for your products on Google and you must consider implementing a proper ‘search marketing’ plan for your brand. When your customers search for you on Google, you have to maintain your presence on time! 4) Finally, this means you now have to update all your old PowerPoint presentations to say “3.2 Million Sri Lankans on Internet” and “15% Penetration into population”, instead of the 2.5million and 12% numbers you have overused in 2012 :-).